The first flight to happen in the Albuquerque area was in June of 1882. 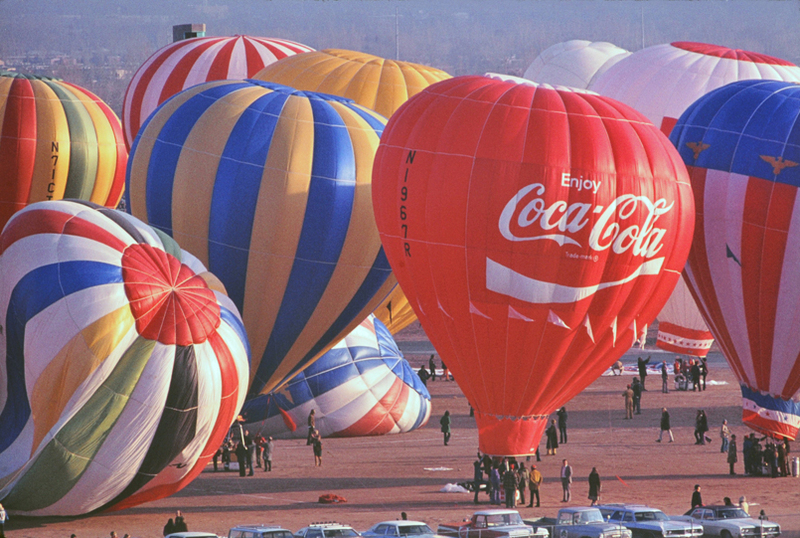 The Fourth of July was coming and the 4,000 residents of downtown area was getting ready to celebrate with horse races, footraces, the big baseball game between the Albuquerque's Browns and Maroons, and a special new attraction...a balloon ascension!!! The owner, "Professor" Park Van Tassel, of a very popular saloon called the "Elite" located on Railroad Avenue (known today as Central Avenue) had bought a 30,000 cubic-foot hydrogen balloon from a famed aerostat maker named F.F. Martin in San Francisco, California. The balloon envelope was made of Goldbeater's Skin with a wicker basket underneath supported by a hemp-rope net. 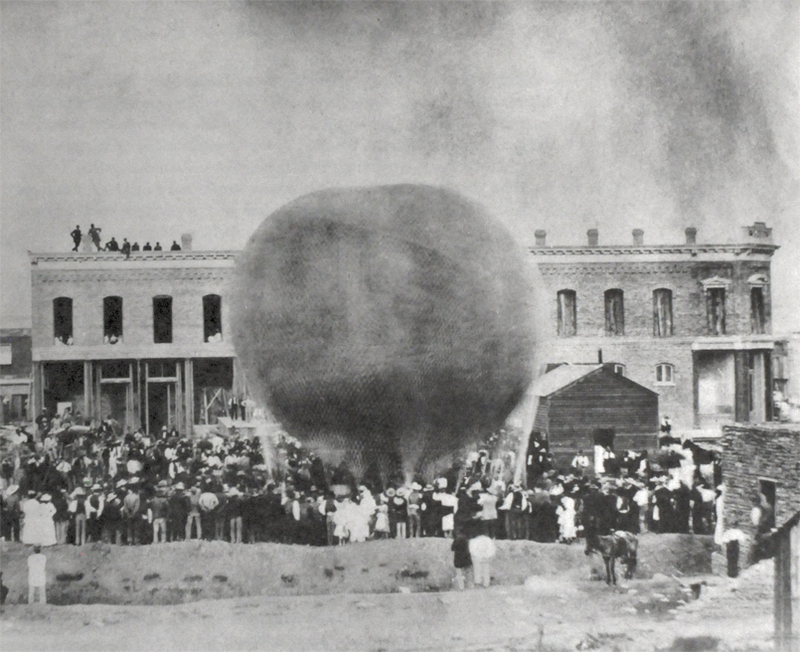 In the late afternoon on July 3rd, Van Tassel set up the balloon on a vacant lot located on Second Street and Gold Avenue next to an illuminating gas plant. This plant provided coal gas for lighting fixtures used by the community. The balloon named the "City of Albuquerque" started to fill with the highly combustible gas, as a contingent of peace officers tried to keep the public away from the danger of blowing up the town. All through the night the balloon gas continued filling. The task to fill the balloon was not completed until late afternoon on June 4th. Van Tassel tried to lift off by throwing out the ballast bags, but the balloon refused to rise. In his desperation to get of the ground he threw out another bag. The ballast bag hit a bystander who later filed a lawsuit; this was possibly the first aviation litigation in Albuquerque. After rising above the housetops the balloon rose rapidly, taking a southerly course, and the people faded away until they seemed one black mass of humanity. The balloon continued its course until it hung over the Rio Grande, which appeared like a tiny silver thread. An altitude of 11,000 feet (6,000 feet above Albuquerque) above sea level had been reached. The airship then remained stationary for a few minutes until it struck a current of air that bore it rapidly toward the west end (Old Town). After traveling in that direction for two miles, I thought I would go up higher, and emptied the contents of one bag of ballast over the side, and in a few minutes the barometer registered 14,207 feet high. I thought that high enough, as it was becoming difficult to breathe, and the air was cold, so I pulled the valve rope and after some difficulty succeeded in opening it. I was just over the fair grounds then, and as the balloon began going down rapidly I shut the valve, but had to throw out my coat, basket of lunch, bottles of water, etc. to keep from going down fast. As I neared the earth I threw out my anchor, which caught in a ditch and held the balloon settled, and I got out of the balloon with everything in good order. He had landed in a corn field in the back of the fair grounds located near the Central Avenue and Rio Grande Boulevard. The balloon was loaded onto a wagon and the first aviation event in Albuquerque had come to an end. Park Van Tassel sold his saloon and with his wife started a career barnstorming the country with his new balloon. He was not very successful and suffered several bankruptcies and legal attachment of his balloon. Rumor has it: he tried to fly across the Pacific and perished at sea. The next flights took place 25 years later at the New Mexico Territorial Fair of 1907. 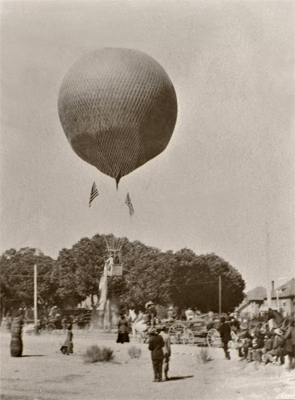 Musician turned aeronaut, A. Joseph Blondin, convinced fair officials to give balloon tethered rides during the fair to be followed by a free-flight. Roy A. Stamm, the fair secretary, backed the idea and loaned Blondin one of his old sprinkler wagons from his wholesale fruit business to be converted into a hydrogen gas generator to fill the balloon. The wagon proved to be incapable of providing sufficient amount of gas to fill the balloon. Not being able to give tethered rides during the fair, Stamm and Blondin were determined to give the crowd a chance to view a balloon in free-flight over the fair grounds. Colonel A.P. Hunter, visiting with his Fifth Cavalry contingent, was asked by Blondin if his soldiers could walk the half filled balloon to the illuminating gas plant near the railroad yards to complete filling of the envelope. The next day Blondin cast off and spent seven hours in the air. He flew a course parallel to Fourth Street to the present Corrales Bridge. He came down on the West Mesa about four miles northwest of Corrales. The trip was not without peril. While drifting over several ranches Blondin watched as several ranchers shot at the balloon with rifles. He watched as their rifles barked a rings of smoke eight different times as his balloon traversed the 18 mile trek up the Rio Grande Valley. Roy Stamm took great pride in his part and bought the balloon then stored it in this fruit warehouse. The Territorial Fair being organized for 1909 was of great anticipation. President Taft was scheduled to attend sometime during the run. The fair had contracted Charles Stroebel to provide a small cigar-shaped dirigible to fly during the exposition as well. The fair committee got a wire from Stroebel that he could not attend because his dirigible had crashed and burned. The committee contacted Roy Stamm to dust off his balloon and help fill the gap in giving rides at the fair. Roy once again procured Blondin in help to fly the balloon. 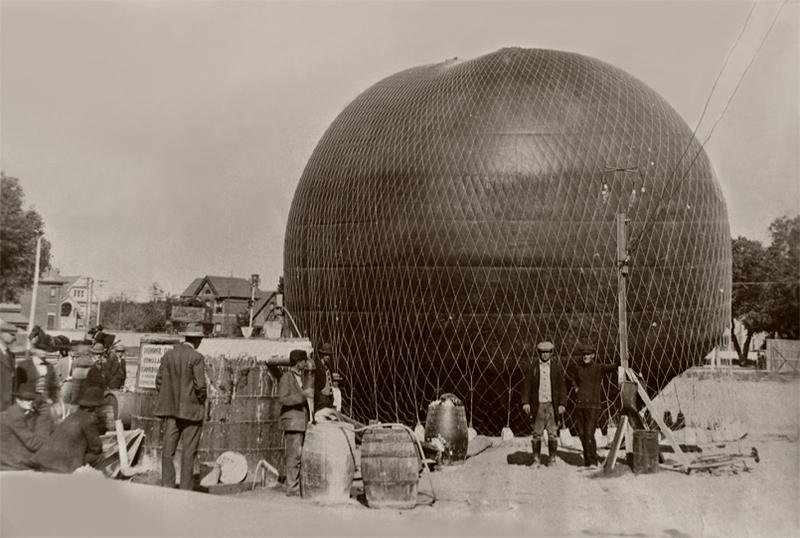 This time Blondin was given enough money to build a proper hydrogen generator for filling the balloon. The generator was constructed using a wooden tank in which iron filings and sulfuric acid were mixed to form the hydrogen gas. Cold water and lime was then sprayed on the gas to neutralize any sulfuric acid. It was during this process that Roy saw a water seal about to give way, he threw himself on the tank and was blown several feet in the air in an eruption of water and sulfuric acid. Roy was fortunately not seriously injured. The accident was caused by mixing water and acid in the wrong sequence, a lesson many who have taken a chemistry lab course has learned the hard way. Few wanted to stay up longer than ten minutes at the 500 foot level. Once they were back on the ground some appeared to look a little "white around the gills". Both pilots prepared the balloon for the free flight ascension they had planned to do as the fair was coming to a close. They packed provisions for a week's worth of flights. They had a barometer to determine the altitude, a statometer to judge whether the balloon was rising or falling, and a compass for determining direction. With all provisions on board, they added two U.S. flags, then christened the balloon with the name "Albuquerque". They lifted off in the late morning hoping to fly as far as St Louis, Missouri. They cleared the Manzano Mountains by 1,000 feet and then drifted into the Estancia Valley. A rancher near Escabosa took a shot at them as they past overhead. Reaching an altitude of 12,792 feet over Moriarity the balloon came down at the base of the Pedernal Mountains ten miles southeast of Clines Corners. They had traveled a total of ninety miles from Albuquerque. This was just the beginning for aviation history for Albuquerque, and even throughout New Mexico. As the years were to progress the city and state would see airports and air traffic rise to bring travelers, tourists, and economic boon. To continue your journey through Albuquerque and New Mexico's Aviation History, please visit the Early Days of Aviation page. 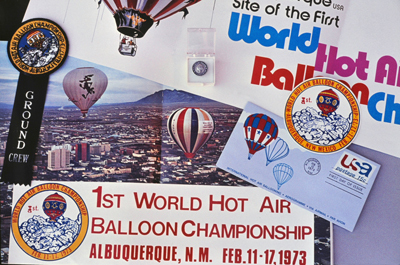 Balloons would return to Albuquerque's skies in a big way in the 1970's. 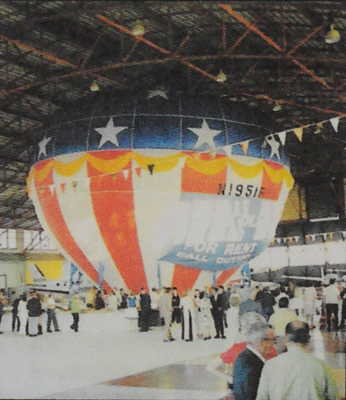 In the spring of 1971 two pilot brothers Sid and Bill Cutter were having a party for their customers in their hanger to celebrate the 42nd year of Cutter Flying Service. Sid got a full-size hot air balloon as part of the decorations for the party since hot air ballooning was a craze starting to become popular at the time. The balloon was then inflated in the center of the hanger for the party. The next morning after recuperating from the party, Sid and Bill decided to try and fly the balloon. After learning the art of flying a balloon, others became interested and soon more balloons started to be seen over Albuquerque in the early morning, drifting with the winds. In June of 1972, 13 balloons were organized into an event in celebration of KOB radio station's 50th anniversary. A contest was held called a Roadrunner and Coyote race. One balloon would become the Roadrunner and take off, fly some distance and land. The other balloons (called the Coyotes) would take off and try to land as close to where the Roadrunner had landed to win. 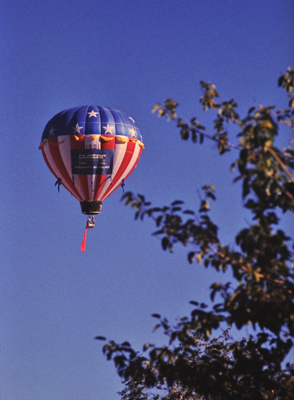 In February 1973, the First World Hot Air Balloon Championship event was held and the die was cast. Every year since, the Albuquerque International Balloon Fiesta has become the biggest event held in the world for Hot Air balloons. Every October, for 9 days, hundreds of balloons fill the skies with every color, shape, an size imaginable!!! All because two adventurous pilots found floating through the air in a balloon could be so much fun.